An image sensor is the digital equivalent to film in a conventional camera. Unlike film, however, the image sensor is built into the digital camera and cannot be changed for different situations. The most common sensors used today in digital cameras are the CCD (Charged Couple Device) and the CMOS (Complementary Metal Oxide Semiconductor). If you want to know which kind your camera has, go to the specifications page in the owner’s manual. The full details on how image sensors work is beyond the scope of this lecture series, but a few things that do affect your images are important, and that is what we’ll be covering here. Images created with a digital camera are made up of pixels, which are small squares of color ( or shades of gray in the case of a B&W image ). The camera’s image sensor must convert the light it is exposed to into these pixels to render an image. Image sensors are comprised of millions of tiny photo sensors (pixels) that record the intensity of light as an electrical charge. It then converts this charge into digital information that is used to create the final image. The data must go through various stages of interpretation and conversion, but for most practical applications it isn’t necessary to understand all the specific details. It is important, however, to recognize that image quality can be affected by this technology, and some cameras do a better job than others. One factor to consider is sensor size. In most digital compacts, image sensors cover only about 4% to 7% of the image area of 35mm film. Digital SLR image sensors will generally cover from 33% to a very few that cover 100% of the 35mm film area. Since larger sensors have larger pixels, they can record more detail and produce smoother images. Generally, larger sensors capture images with less noise and greater dynamic range than smaller sensors. When choosing a digital camera therefore, it is important to consider the actual size of the sensor as well as how many mega pixels the camera has. A 5 megapixel digital compact camera will not necessarily have the same quality as a 5 megapixel DSLR (digital single lens reflex). The sensor size has what is referred to as a crop factor, or a focal length multiplier. This is a number that relates the smaller sensors to a full frame 35mm area. It is one of the reasons that a full frame 12 Mega Pixel DSLR will usually create a higher quality image than a 12 MP camera that does not have a full frame sensor. NOTE: Don’t confuse larger ‘sensor pixels’ with larger ‘image pixels’. 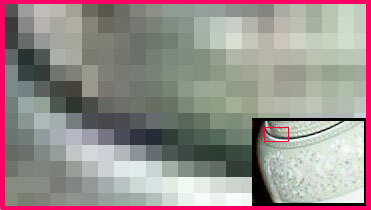 A larger sensor pixel can collect more detail, and produce finer images. This is good. Large pixels in the photo image mean less quality and can cause pixelation…this is when you begin to see the pixels in your image. This is not good. To use an analogy, say you have 5 million blocks and they need to fit into a .25 inch x .375 inch area (size of a typical compact digital camera image sensor). The blocks would need to be small enough for all 5 million to fit. Now let’s say you have a 1 inch x 1.5 inch area (approximate size of 35mm film) to fit the same number of blocks into. Having more area to work with would therefore allow each block to be made larger. The same idea holds true for sensor pixels. To fit 5 million pixels into a smaller sensor, each pixel must be reduced or compressed. This compression can reduce the amount of data each pixel can gather. This is why pixel count should be only one of several factors you compare when considering image quality. It would be important to understand this technology for anyone doing a serious review of various digital cameras. But for most photographers it is something you need to be aware of, if only to realize that pixel count alone is not enough to assure you of high quality images. Comparing final image results is the best way to judge a camera’s performance. When you take a picture, you are exposing the image sensor to light. The data collected by the sensor’s pixels are recorded, analyzed and processed to yield a digital image that looks similar to the scene you photographed. This complex operation is another factor which affects final image quality, and varies from one camera to another. Such matters as noise, color accuracy, sharpness and tonal range, to mention but a few, are all affected by this process. So again, the importance to you as a photographer is best seen by comparing final results. Fortunately, there are some excellent review sites that do this for you. Therefore, you don’t need to actually test every camera yourself. But knowing a little about sensors and pixels will help you better understand these reviews. Whenever you want to compare cameras you are considering, or learn more specifics about a camera you already own, just do a search for digital camera reviews on any major search engine to find a list of these review type sites. You’ll locate some excellent sites that do extensive in-depth comparisons of most of the popular cameras available. They will usually have samples of actual photos taken with these cameras as well, so you’ll be able to see the level of quality each can produce. There are many others for you to choose from, but these are 3 I have used myself and am most familiar with.